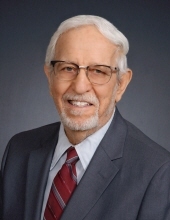 John D. Wierzbicki, age 87, a resident of Romeo for over 20 years and previously from Shelby Township, passed away on Saturday, March 30, 2019 at his home. John was born September 9, 1931 in Hamtramck, Michigan, the son of Dominic and Marie (Mintar) Wierzbicki. He married the former Joan T. Schotthoefer on February 16, 1952 at Guardian Angels Catholic Church in Detroit. After serving his country proudly during the Korean War in the Army, John became co-owner of “Key Welder Corporation” in Roseville making robotics for the automotive assembly lines. While working & raising his four children, John earned his engineering degree to enhance his business. John retired in 1999 and was then able to spend time with his family, big game hunting, fishing, and being with his many grandchildren. Along with his wife Joan, they were longtime members of St Clement Catholic Church in Romeo. John is survived by his wife Joan, children: Ann Marie Kuykendall of Lake Orion, MI., Richard (Cynthia) Wierzbicki of Austin, TX., James (Donna) Wierzbicki of Grand Rapids, MI., and daughter-in-law Gayle Wierzbicki of Shelby Twp., MI. Also survived by 11 grandchildren and 12 great grandchildren. John was preceded in death by his son John D., son-in-law Terry Kuykendall, and brothers Dominic Jr., & Robert. Funeral services will take place on Wednesday, April 3, 2019 at St Clement Catholic Church of Romeo. Visitation will take place on Tuesday, April 2, 2019 from 3-8 PM at the Henry M. Malburg Funeral Home, Romeo Michigan. Donations to the Capuchin Soup Kitchen in Detroit would be appreciated. To send flowers or a remembrance gift to the family of John D. Wierzbicki, please visit our Tribute Store. "Email Address" would like to share the life celebration of John D. Wierzbicki. Click on the "link" to go to share a favorite memory or leave a condolence message for the family.